In 4-quart Dutch oven, heat butter over medium heat. Add onion, carrots and celery; cook 5 to 7 minutes, stirring occasionally, until vegetables are crisp-tender. Add flour, thyme, salt and pepper; cook 1 minute, stirring occasionally. Gradually stir in broth. Heat to boiling, stirring frequently. Boil and stir 1 minute. Add chicken; reduce heat to medium-low. Simmer uncovered 13 to 18 minutes, stirring occasionally, until juice of chicken is clear when center of thickest part is cut (at least 165°F). Transfer chicken to cutting board. Using two forks, shred into large bite-size pieces, and return to Dutch oven; heat to simmering. In medium bowl, stir Bisquick™ mix and milk together until soft dough forms. Drop by tablespoonfuls onto simmering stew. Cover and cook over medium-low heat 9 to 11 minutes or until dumplings are completely cooked in center. To freeze: Cook chicken stew as directed in recipe in steps 1 and 2. Cover and refrigerate chicken stew 30 to 40 minutes. Divide stew between two 1-quart freezer containers; cover and freeze up to 2 months. 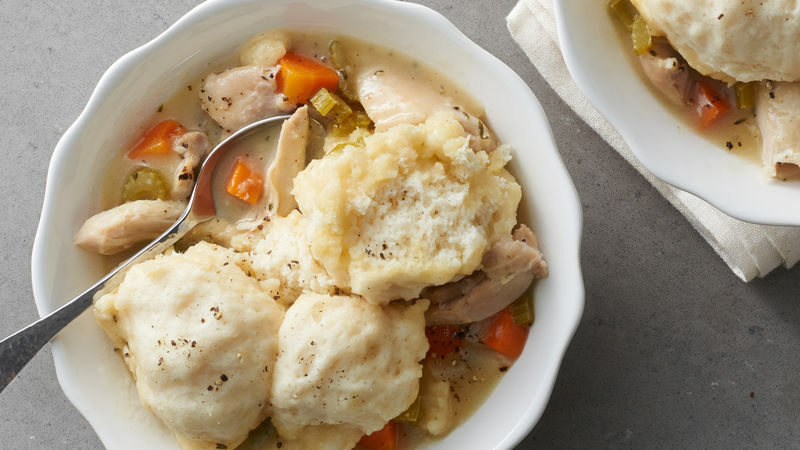 To finish chicken and dumplings: Place frozen chicken stew containers in large bowl filled with hot water about 5 minutes or until stew can be slid out of containers into 4-quart Dutch oven. Cover and cook over low heat, stirring occasionally, until stew is heated to boiling. Make and cook dumplings as directed in step 3. To keep Bisquick™ mix fresh longer, refrigerate after opening it.